Helsinki, 15.2.2018, Icareus has delivered its Icareus Playout EPG platform to telecom operator PCCW, the leading PayTV, IPTV and OTT service provider in Hong Kong and elsewhere in Asia. Icareus Playout EPG is used to receive, manage and distribute EPG data to PCCW’s TV services. Icareus Playout EPG platform was selected because it offers flexible, versatile and economical EPG platform meeting the specific requirements of PCCW. Icareus Playout EPG enables PCCW to receive PSI and EIT information from satellite receivers, manage the channel data and contribute the data as XML to PCCW’s IP based TV platforms. Icareus Playout EPG offers versatile and efficient operational tools and for viewers a high quality TV experience. 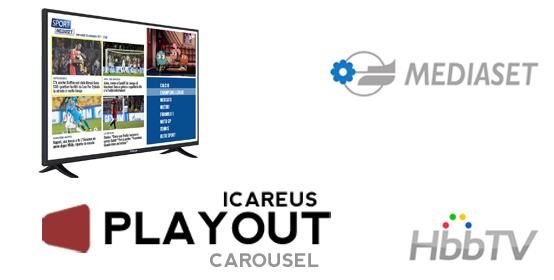 Icareus’ systems integrator partner Mediatech is responsible for the sales, integration, installation and delivery of the Icareus Playout EPG platform to PCCW. PCCW Limited (Pacific Century CyberWorks) is the holding company of HKT Group Holdings Limited, a Hong Kong based information and communications technology (ICT) company and PCCW Media. PCCW Media is a leading, fully integrated multimedia and entertainment group in Hong Kong. PCCW Media operates the leading pay-TV service in Hong Kong under the Now TV brand delivering both self-produced and licensed content to its customers using advanced IPTV technology. Now TV offers more than 180 linear channels of local, Asian and international programs. Its premium content can also be accessed on-demand and on the go via Now Player app. It is also a leading producer of Chinese language news, financial news and sports programming. . PCCW Media is also engaged in the provision of over-the-top (OTT) video service under the Viu brand in Hong Kong and other places in the region. PCCW is headquartered in Hong Kong and operates in Europe, the Middle East, Africa, the Americas, mainland China, and other parts of Asia. Helsinki, 15.2.2018, Alfa TV, a growing TV channel in Finland has taken the Icareus TV Everywhere solution in use as a cloud service. Icareus’ solution provides AlfaTV an opportunity to manage and distribute its TV programs and other video content online. The service is operated by Digita, the national Finnish digital TV network operator. AlfaTV is a free-to-air TV channel seen in different TV networks in Finland, available in cable, IPTV and terrestrial TV networks. 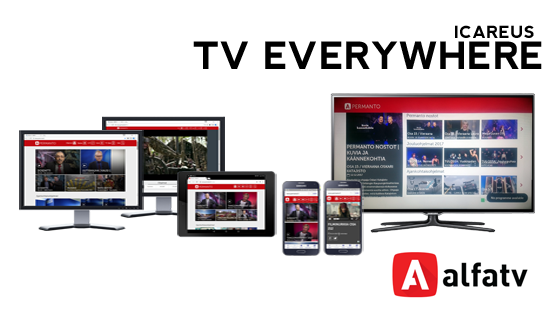 Icareus’ partner company Digita, which is also the national TV network operator, has delivered Icareus TV Everywhere solution to AlfaTV to manage AlfaTV’s online video presence. The delivery includes Icareus TV Everywhere solution based in Icareus Suite Online Video and TV Platform (OVTP) from cloud environment, CDN (content delivery network) service to distribute the content and Icareus’ template based responsive web UI, video players and HbbTV SmartTV service for content presentation called “Permanto”. For AlfaTV Icareus TV Everywhere provides a robust content platform including efficient tools for uploading the video content to cloud, automatic transcoding the video files to wanted presets, versatile options to manage the content and its metadata as well as then distributing it in best possible quality. This scaling platform to meets the needs of small or large audiences. Icareus TV Everywhere solution: Icareus helps TV broadcasters and channels to reach their TV audience at anytime and anywhere with Icareus TV Everywhere solution. 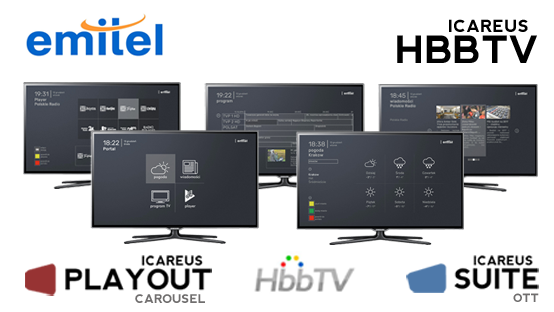 Icareus TV Everywhere solution includes service Icareus Suite service management platform and TV applications to almost on any device that broadcaster and TV channel can utilize: HbbTVs, SmartTVs, desktop environments, tablets and mobiles. Feature set is configures based on needs and can be e.g. Live TV, Catch-up TV, EPG, Favorites, Social media and multi-language interfaces, just to name the core ones. AlfaTV is free-to-air TV channel ran by Finnish company Brilliance Communications Oy. The channel was launched in December 2013 and it is a commercial generalist TV channel that broadcasts movies, entertainment, culture, actual and theme programs. The channel can be seen on cable, IPTV and terrestrial TV networks in Finland. For more information, visit (only in Finnish): http://alfatv.fi/ or http://www.permanto.fi/. Icareus TV Everywhere solution for TV broadcasters, , channels, operators and other content providers.